Ferrocarrils de la Generalitat de Catalunya authorizes the reuse of content and data worldwide, with no time limit or restriction, in compliance with the terms established by Creative Commons CC0, pursuant to Art. 17.1 of Law 19/2014, of December 29th, on Transparency and Access to Public Information, and beyond Art. 8 of Law 37/2007 on the Reuse of Public Sector Information ( ensuring the citation of the source, the non-alteration or distortion of the information and specifying the last update date), and provided that it does not contradict the license or notice that a work may have, the provisions of which will prevail. Furthermore, Ferrocarrils de la Generalitat de Catalunya undertakes to build responsive websites that are usable and accessible, ensuring, thus, the access to anybody regardless of his/her physical, sensory or intellectual abilities or the kind of device used to visit them. Law 37/2007 on the Reuse of the Public Sector Information. In accordance to Art. 17.1 of Law 19/2014, of December 29th, on Transparency, Access to Public information, the reuse of information is free, with no restrictions, except in those cases in which, in accordance to regulations, the information is subject to getting a recognition license for the protection of other rights or legal assets, or at the request of the interested party. The Law 37/2007, of November 16th, on the Reuse of Public Sector Information, that transposes the Directive 2003/98/CE of the European Parliament and Council, and is amended by Law 18/2015, of July 9th (which in turn transposes Directive 2013/37/UE), regulates the reuse of public information available for the administrations and bodies in which they have a majority ownership. In other words, the right of all potential market agents to reuse the information of the public bodies. 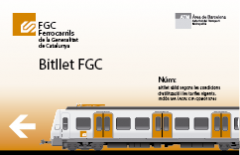 According to this regulation, Ferrocarrils de la Generalitat de Catalunya authorizes the free reproduction, distribution and public communication of the work, and, furthermore, its transformation into derivative works, for everyone and without time restrictions, in accordance to the terms established by Creative Commons CC0 Legal Instrument, and provided that it does not contradict any license or notice that a work may have, the provisions of which will prevail. E.g. 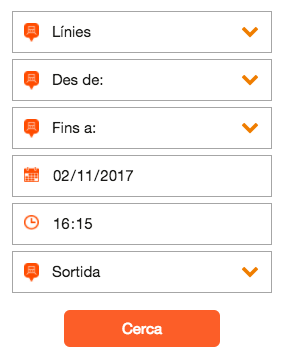 : Ferrocarrils de la Generalitat de Catalunya. Except in cases in which there is a specific license, the authorship and the ownership of the exploitation rights shall be acknowledged. 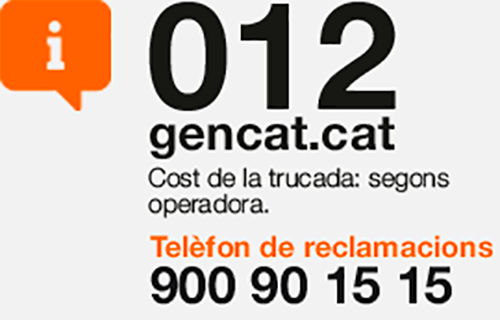 Check the addresses of the Generalitat departments and their autonomous bodies. Law 18/2015, of July 9th, on the Reuse of the Public Sector Information modifies Law 37/2007, of November 16th. Similarly, reuse can be limited by the protection of other priority legal rights, such as the personal data, privacy or third party intellectual property rights. The reuse of works protected by intellectual property rights can be formalized by means of the use of open content licenses, such as those of Creative Commons which give certain exploitation rights of works. 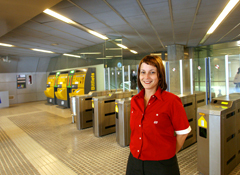 In contents in which said licenses are applied, reuse is permitted in the established conditions. Under no circumstances the use of logos, brands, coat of arms and distinctive symbols of Ferrocarrils de la Generalitat is authorised in publications or websites which do not have any involvement or are not sponsored by this institution. These elements of corporate graphic identity are exclusively owned by FGC and are protected by the applicable legislation in force. The concept of reuse of the public sector information refers to the use that people, companies and organizations can make to create new products and/or services for other communities or recipients. Should any discrepancy arise between the administrative information provided by this website and the documents that are the source of the information, the latter will prevail, the printed edition of which certifies both its authenticity and content. FGC does not guarantee the absence of virus or other elements that could cause damage to the computer systems, electronic documents or files belonging to users of this website or third-party websites, for which reason FGC takes no responsibility for any harm that might be caused in this way. FGC takes no responsibility for any misuse of this website. This legal notice is only applicable to the information gathered and the services delivered through FGC website. FGC neither guarantees nor takes any responsibility for interruptions or errors when accessing to the website, and takes no responsibility for the possible consequential damages thereafter. The terms and conditions governing this website, as well as the relations that might arise from them, are protected and governed in every case by the applicable laws at autonomous community, state or European level.